You're never too young or too old to dream. 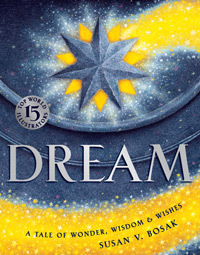 Dream: A Tale of Wonder, Wisdom & Wishes by bestselling author and educator Susan V. Bosak explores hopes and dreams across a lifetime. Illustrated by 15 top artists from five countries, the multilayered story is accompanied by inspiring quotations from historical figures. Every age takes away a little something different from the book. Dream is narrated by a wise old star, an elder grandparent/mentor figure. The star guides the reader through the story. The refrain of "Dream a dream with me" is the star serving as a mentor, helping the reader learn about and understand life until, at the very end, the star, having fulfilled its role, turns it over to the reader with "dream a dream... your very own dream." The story begins on the yellow page, where we all begin: as a baby who must learn everything there is to learn. As a toddler, we explore the world around us. As a child, we explore the world of the imagination. Then you become a teenager, with all the questions and choices. As a young adult, you start making your way up the mountain of life. At this point (pages 14-19), the story opens up to everything that has come before you, everything on which your dreams are built: great people from throughout history; great ideas that have changed the world and how we live; and the value of culture and learning. Then the story returns to the level of the individual and the gray pages: overcoming the inevitable obstacles that come up as you go through life. Finally, on the green pages, the star reveals the secret to growing a dream: "You need the Believe of childhood, the Do of youth, and the Think of experience." You need all three parts of yourself, and the world needs all generations to work together. The story comes full circle and returns to the color yellow. The old star accepts life as it has been lived, then wishes to give something to the next generations, to "those who follow" – the gift of hope, of dreams. That's the very best legacy we can all leave. There are many levels to dreams, from personal goals to aspirations for a better community and world. Young and old can share all their Different Dreams. Dreams change across a person's lifetime. At the same time, at certain ages many people have similar dreams and goals, though they're shaped by the historical time period. Dreams Then & Now prompts a child or teenager to compare some of their favorite things and dreams/goals to the favorite things and dreams/goals of an older adult when they were the age of the younger person. Also try the Hot – And Not comparison sheet. Each illustrator in Dream has hidden a star somewhere in their illustration. Some stars are easier to find than others. Can you find them all, and make a different wish with each one you find? Making Dream Stars is fun for all ages. 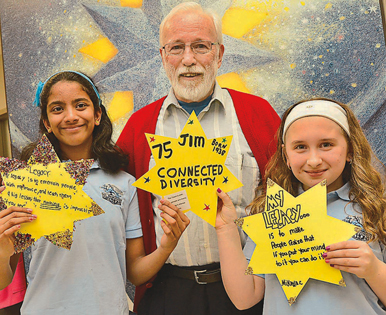 Working as a group, make and decorate Dream Stars with each person's dream for a better community for young and old. Do young people and older people have the same kinds of dreams? Dream ends with the line, "Dream a dream... your very own dream." If there were another page in the book, it would be your dream. You can dream a better future for your community by creating The Next Page. Use art and words to show how you can make your community a better place for young and old. A group can also share the One Thing each person would do to make their community a better place. Can the group choose one of the One Things and work together to make it happen? The green page in Dream with the Dream Tree shows all ages, races, and cultures working together to achieve dreams and make the world a better place. In a magical childhood fantasy scene in Dream, characters from several popular fairy tales and myths are illustrated. Younger children and older adults can talk about and even read some of their favorite Fairy Tale Dreams. Explore the Club of Dreamers. Children and older adults can talk about their own historical heros and how those heros have affected who they are. Find out how people of all ages Connect to a Legacy Moment and their Big Picture Stories – the ways historical events affect and shape who we are. Young people 8-18 years can interview an older adult about their life experiences, hopes and dreams to enter the Legacy Project's annual Listen to a Life Essay Contest. Students in a class can connect with a local seniors residence or nursing home to do the interviews. Life Layers is a life review tool for adults that's an evocative, visual way to map memories. 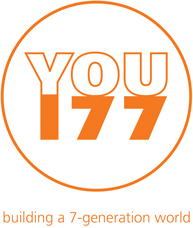 An adult can complete the Life Layers sheet on their own, or a young person can do an interview to help complete the sheet. Helping to map an adult's life is a great way to spark intergenerational dialogue and it helps young people understand how lives evolve and change over time. Each page in Dream shows a different stage of life, from the time you're born to the time you're older. Children and older adults can create a Life Line exploring the ages and stages of their life. Life List and help young people brainstorm ideas for their own list. Ask older adults What Would You Change? This activity sparks discussion and is a way to pass along life lessons without being heavy-handed. Older adults can share their advice for getting From Gray to Green through their own stories about difficult life moments and how they made it through those moments. Young people can discuss and work with older adults to create a Life Statement. We're all part of the human family. The green page in Dream shows a family, the human family, working together under the Dream Tree. How much do you know about your family history? Complete a Simple Family Tree. The central mime illustration in Dream features the large mime's hand, the mother's hands wrapped around her baby, and the small grasping hand of the baby. A young hand with an old hand is a common symbol of connections across generations. Young children and older adults can compare and draw their hands in Little Hand/Big Hand. How old do you think the wise old star narrator in Dream is? Why does the star look "old?" Who is the oldest person you know? How do you know they're "old?" Try the Young or Old? activity. Each time you turn the page in Dream, the people in the illustrations are a little older. The story moves from being a baby to a toddler to a child to a teenager to a young adult and then an older adult. We're all aging and getting older from the minute we're born. Use the Aging From Birth activity to talk about what aging really means. How do young and old both face stereotypes and prejudices? See how much you know about Ageism. Wish an older adult Happy Birthday by creating a life-positive card. All ages have value, including very old adults. After all, years of living and learning should count for something. Help promote a positive view of aging using Poster Power. Stay updated as more activities are added and find out about upcoming workshops and events – sign up for the Legacy Project's e-newsletter. "Richly crafted and thoughtfully written."